It was Christmas morning and Ruth was excited. It was already daylight outside and Karen was still asleep. How could she sleep? Surely Santa was long gone by now! So Ruth quietly climbed out of the bed they shared, tiptoed into the kitchen and peeped her little head around the kitchen door to see if she could spy what he had left. What in the world? That’s mama and daddy putting the gifts under the tree, not Santa. Now, Ruth was only six, but she was no dummy. Something wasn’t adding up here. 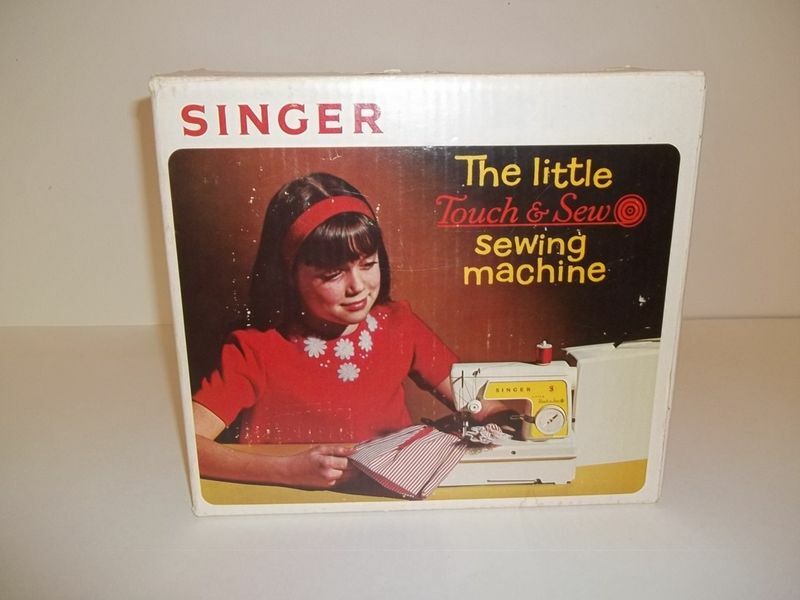 It hadn’t been that long ago that she saw that same little Singer sewing machine in the top of the closet at Ann’s shop. When Ruth asked her about it then Ann told her she was storing it for a customer to give their daughter at Christmas. She wasn’t foolin’ anybody. That was Ruth’s sewing machine all along. So Ruth tiptoed back to bed and climbed in and pulled the covers up. She waited patiently until Karen woke up. And by patiently I mean that she moved about and bounced the bed as much as she possibly could without outright jumping on it like a trampoline. They got up and tore into the living room where there, under the tree, was that shiny new sewing machine, complete with thread and some scraps of fabric. Ruth mentioned to Karen what she had seen, but Karen just passed it off. She was ten so she knew better. There was a Santa Claus and mama and daddy were not it. We didn’t have a chimney, so Santa had to leave the presents outside. Mama and daddy must have brought them in and gone back to bed. That’s all. Ruth had misunderstood what she saw. No matter. Ruth couldn’t wait to use that sewing machine. It was a real one. It plugged into the wall and really worked. Mama and daddy awoke to the rather noisy sound of sewing. Boy that thing was loud. Ruth had set that thing up on the table, threaded it, and went to town sewing those tiny scraps of fabric together. She wanted to be just like Ann. And now she was. This was great! There was just the matter of the whole Santa thing. Ruth couldn’t get it out of her head what she’d seen. And she wasn’t buying what Karen was selling. Karen could go on believing that if she wanted to, but Ruth knew the truth. A big man, in a red suit, delivering presents to all the kids in the world in one night? No way. But Ruth never mentioned what she’d seen to Ann and J.L. She thought it would disappoint them if she knew the truth. So she just let them play the game and she played right along with them. Categories: Uncategorized | Tags: Humor, Just for Fun, Moms, Relationships, The Good Stuff | Permalink. Sometimes I have thinky thoughts that really probably are better left alone. Questions arise in my mind that probably really have no answer, at least not yet, and maybe never. I know I’m not alone in this. My thinky, thoughtful question of the day: Why is that the creationist has no trouble believing that there is a God, that that God spoke and everything was created, and that that God did all the things attributed to Him in the Bible, but that stuff just couldn’t simply be here, like DNA? DNA couldn’t just be. According to creationists something or someone had to have made DNA. The things that are here, tadpoles, fish, grass, trees, dogs, lizards, people couldn’t have possibly evolved. Yet they have no trouble believing that God was just here. Nothing or noone created Him. He just was. How come stuff that’s here couldn’t be just like that? Why does there have to be a creator for there to be things? This is not my way of putting a spin on the “who created God” thing. I just don’t understand why it’s so far-fetched to subscribe to evolution, but a no brainer to think there’s a God the just said, “Let there be _____.”, and there was. ::sarcasm:: I’m very scientific ::sarcasm::. That is all. The Penn State scandal is old news now. There is really no need to rehash the alleged misdeeds of Jerry Sandusky. No. I want to talk about the rage that people feel when they think about a man who did absolutely nothing. A man who allegedly saw Jerry Sandusky violating a child and then turned around and walked away. He passed the buck and thought someone else would fix it. So now when people think about that they get angry. Rightfully angry. Righteous anger. Some people want to know way a rather young, rather large guy, didn’t punch Sandusky in the face. I want to know why he didn’t just say, “Excuse me, Mr. Sandusky, what in the world are you doing?” That’s probably all it would have taken to stop it. At least for that one child. How do you witness that, quietly sneak away, and then lay your head down and sleep for the next dozen or so years? But then this happens quite a bit of the time. People see things, they know something terrible happened, and they look the other way. Somehow they pretend it never happened. When the truth comes out anger ensues. Not just at the party who did the horrible deed, but the person or persons who could have stopped it. How could they have known this and done absolutely nothing? Shouldn’t the people who knew about these heinous acts be held accountable? That’s the problem with idolizing figures and worshiping them. It blinds you. You’re so enamored with the persona that you can’t see the obvious flaws. You’re willing to sweep glaring problems under the rug. Maybe it’s cognitive dissonance. Maybe what you see or find out is so completely contrary to what you’ve believed that you can’t even process it so you begin to rationalize it. After you’re done rationalizing it you somehow twist it around so that it’s not such a bad thing. The evil doer is spreading so much good that surely it outweighs his bad. That seems sick and twisted doesn’t it? Besides this scandal would rock the establishment and we can’t have that. What do we call someone who can willingly turn a blind eye to the suffering of others? What do we say about someone who has it in their power to right a wrong but doesn’t? Why we call him good, benevolent, kind, loving, merciful, gracious and just. We call him God. Categories: Uncategorized | Tags: Abuse, Faith, Fundamentalism, Religion | Permalink. I have very mixed thoughts about corporal punishment of children. As a child I was disciplined in this manner. Only a few times, mind you. It wasn’t my parent’s go-to method of discipline. As I got older that form of punishment was abandoned all together for more painful forms…like grounding. Because of this rearing I cannot say that I believe it to be inherently wrong to spank a child. Will I use that as a form of discipline for my children? It is doubtful. Ultimately I believe that different forms of discipline work for different children. Because, as a child, my dad could speak to me harshly and I’d feel like I’d had a lashing I didn’t require a lot of physical discipline, corporal or otherwise. Neither did my siblings. My parents firm but loving stance on issues when I was small let me know where my boundaries were and what would happen if I crossed them. Michael and Debi Pearl have been in the news again recently, having been linked to another child abuse case. I have not read their book To Train Up a Child. I don’t intend to. Maybe I should to give them a fair shake, but just reading the commentary about the book from it’s very own authors and advocates is enough for me to know that I would disagree vehemently with it’s contents. In the book spanking for children as young as six months is prescribed. That is the most absurd thing I’ve heard in long time. Spank a six month old? What is more is that this spanking is prescribed with implements such as a thin dowel rod or pvc pipe or with a length of hose. Ridiculous. These methods are designed to break the will of a child. Break the will of a child? Is that what you want to do as a parent? I’m not sure it is. Now, If you have a strong willed child you may sometimes wish that’s what you could do. But isn’t what you are really after to teach your child how to use their will? If you break the will of a child, do they have any personality and thoughts of their own? Don’t you want your child to be an individual, not a follower? Evidently this book also prescribes some form of isolation and/or fasting for the disobedient child. I’m not sure if this fasting is an isolated instance of sending a disobedient child to bed without dinner or if it is the prolonged withholding of food. Some grown ups I know could use a good time-out. But prolonged withholding of food and affection isn’t discipline, it’s abuse. A number of parents who have followed the advice in the Pearl’s book have either taken this so far as to result in the death of their child or have been investigated and found guilty of child abuse. The Pearl’s deny any wrongdoing on their part. They say that these parents are taking their advice to extremes. Maybe so. This is another topic I am torn about. How much responsibility do the Pearl’s bare? By their own admission they are, in my humble opinion, abusive. Does that mean that others have to follow suit? Where does personal responsibility begin and end? Would these same parents be equally abusive without such a guide? Maybe the Pearl’s are arming already abusive people with tools to carry out their own sadistic tendancies. Whatever my thoughts about forms of discipline, I believe it should be constructive not destructive. It is not necessary to destroy a child to teach them acceptable behavior. Discipline is not punishment, it is instruction. I’m neither an advocate of corporal punishment nor am I totally against it. I don’t believe it should be a primary form of disciplinary action. It should never be done in anger. No disciplinary action should be done in anger. It should be for the devolpment and instruction of the child. This video is a prime example of corporal punishment carried to an extreme. It is difficult to watch and may be a trigger for some. It is yet another story of a parent or parents who cannot manage their own anger, transfering to the child. Train up a child indeed. Whatever and however you treat your children they are unlikely to depart from it, passing maltreatment or goodwill from generation to generation. She’s breathing so hard. Her heart is racing. A cloud of dust pluming with each strike of her foot on the dry ground. The sandals she wore broke long ago and now she carries them in her hands as she runs far, far away. Her face muddy from the dirt and the tears it was covered in, she sits down under a lone tree along the path. She wipes the blood from her lip. As she leans back against the tree visions of what her life could be like danced through her head. She sees herself tend her children, the garden and the livestock, and gaining the adoration of her husband. She sees a table filled with the richness of their bounty, vegetables from their garden, bread she’d made with her hands, lamb from their flock. Love fills her imagination. She conjures feelings of lightness, hope and freedom. Having caught her breath she rises, picks up her sandals, and begins the long walk back to that place that she can never really leave. Running away means giving up her children and being alone. She is owned, a possession, damaged goods. Those were just dreams after all. He may possess her, but he cannot control her daydreams. There she can be free. Categories: Uncategorized | Tags: Abuse, Divorce, Freedom | Permalink.